The Best Kitchen Design ideas and Secrets – Carpentry Time, Inc. The best kitchen designs require a combination of modern luxury and classically functional. The important part should be the materials and build-quality, no matter what style or aesthetics you are going for. Kitchen appliances, if it is not literally built into the cabinetry, should be decided on separately from your design budget. Here are a few tips and ideas on how to get the most from your kitchen design no matter what your layout and budget is. The classic kitchen design, galleys, are very simple, yet can still be very impressive with the right selection of form and function. You have two walls that allow you to efficiently compartmentalize your kitchen. One wall can be dedicated completely for storage, access, and clean-up. The other side would be just for workspace and cooking utensils. This is arguably the best solution for small apartments or homes that don’t have a lot of floor-space, so taking advantage of vertical space is the goal. More elaborate kitchen layouts include L-shaped and U-shaped floorplans. These kitchens are a fusion of style and function. L-shaped kitchens allow for the introduction of an island with barstools. 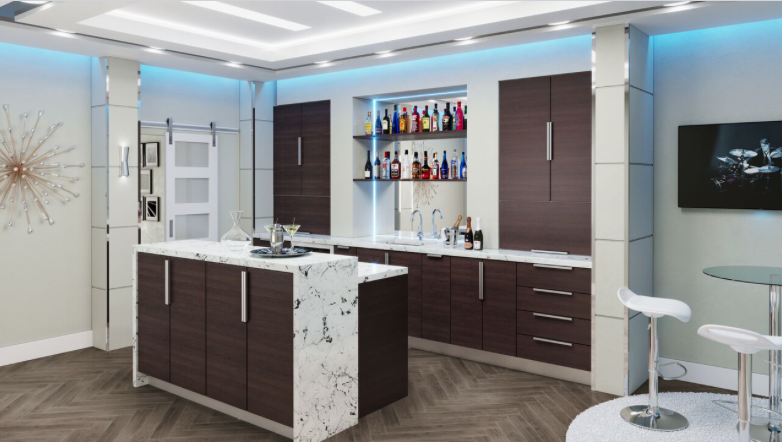 U-shaped kitchens will be the ideal layouts for luxury homes that mimic the cooking TV shows, where the middle has an island/prep-counter, plenty of space for wall appliances, stoves, fridge, and functional wood cabinets. You can also implement these things for other floorplans, but it is easiest when down with the U-shaped designs. 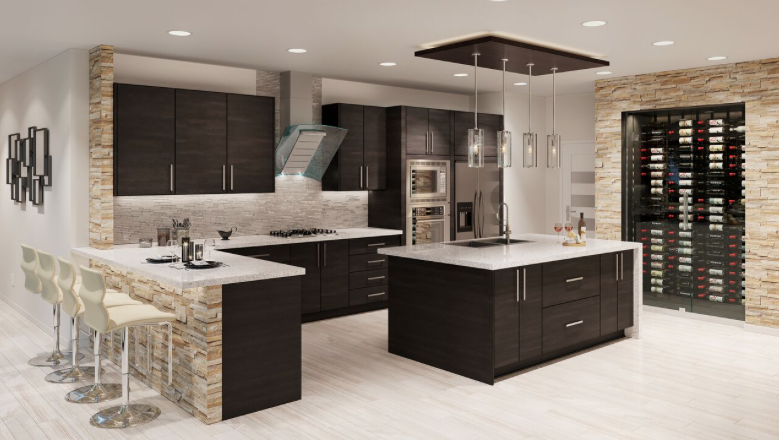 When it comes to luxury kitchens, the style of your cabinets isn’t necessarily important, but the build quality is often difficult to find without moving up to your cherry, rosewood, mahogany, or ebony selections. This is definitely not where you want to cut corners due to budget concerns. The secret way to guarantee quality-made cabinets, without paying for the luxury price tag, is to shop for the cabinets that are made by luxury brands that are without the intricate and custom carvings. It is often cheaper to go with plain canvasses and find DIY solutions or artists to accent them afterwards. The first order of business before you start hunting for your dream line-up of appliances should be to nail down the countertops. The go-to build quality should be granites or marble, but if not, corian and quartz are great alternatives. Adding in accents of mosaic tiles are also very popular addition, they are both stylish as well as long lasting, easy to maintain. A secret rule of thumb for keeping the mass of your countertop is to order your cuts at about 20mm thick, but with an edge that is cut on the outside to represent a thicker piece. The difference in actual width does not matter, you shouldn’t have any worries about fractures or breaks. When you are ready to start planning for which types of appliances and accessories, start with the fridge, stove, and kitchen sinks. These components increase the overall value the most, coming after the remodeling of cabinets and countertops. Small appliances come last, but don’t be surprised if they end up adding up to as much as a single large appliance. ← What exactly makes a bathroom so successful?